The sartorial elegance of the gentlemanly look is making a come-back. 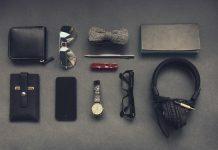 As men, I and others are making more effort in dressing up with a classy touch to our everyday wear. If you’re a typical guy like me there are still slight adjustments we take for more dapper look. I tend to prefer wearing accessories that combine aesthetics and function. But I found a gem that offered an additional technological twist in Original Grain’s The Barrel line. 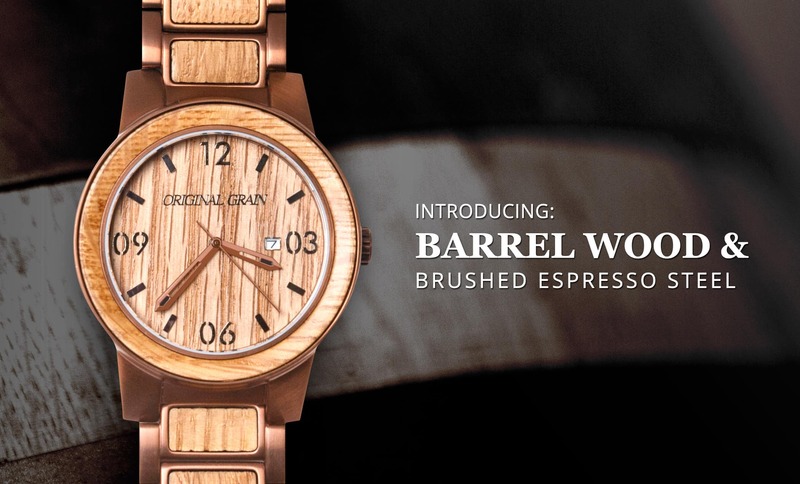 Brothers Ryan and Andrew Beltran made Kickstarter history in 2013 when they raised nearly $400,000 for their all-natural hardwood and stainless steel watch collection, Original Grain. With their commitment to quality craftsmanship and unique design, they are now back with a unique collection that features not only their signature quality design, but also the option of the infusion of Apple Watch. 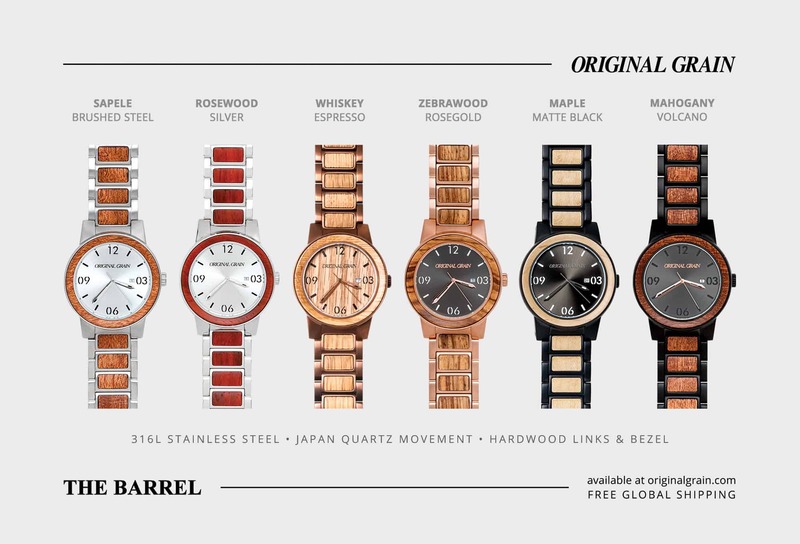 This line features six watches that are all inspired by the designs of the original barrels. While trying out one, I was impressed that no element was overlooked in its effort to stay true to the design of the original barrels. From the thickness of the lugs to the detail on the case, and the feel of the watches, everything was on point and added to the overall beautiful, masculine aesthetic of the watch. The Barrel line has five stainless steel and exotic hardwood models to choose from. The sixth piece is its feature design, the Whiskey, handcrafted with authentic, reclaimed American Oak Whiskey barrels. Upon checking out the Whiskey piece, I noticed that it still contained a trace of the spirits in the wood. I double checked to see that this wasn’t a defect. I was surprised to learn from the makers that each Whiskey piece was truly made from authentic barrels. More than its unique design, The Barrel also addresses your technological needs. With the release of the highly anticipated Apple Watch, people may tend to ignore their traditional timepieces. If you’re like me, I prefer to maintain a more classic look and so the Barrel line is definitely for me. With this line, you have the option to include a first-of-its-kind DUO band that will serve as an adapter for the Apple Watch. 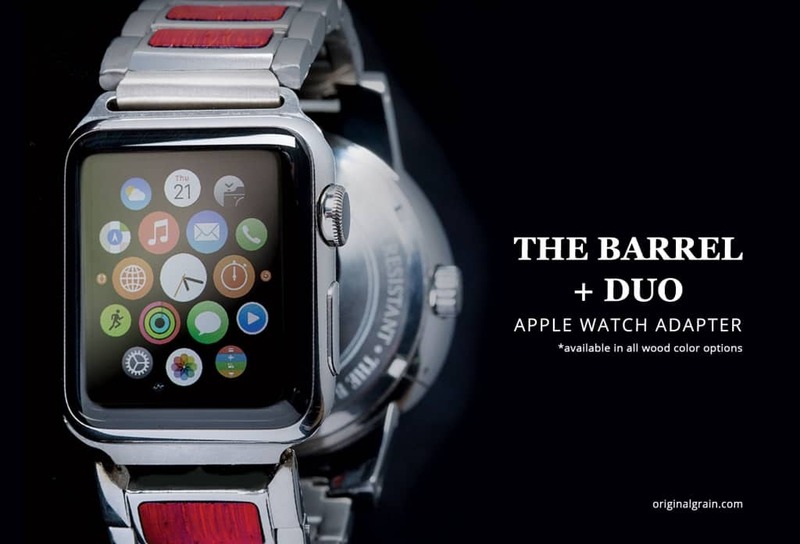 You will have your Barrel time face displayed on the outer wrist, while your Apple Watch rests on the inner wrist. As I mentioned, if you are a fan of Apple products but the idea of having all of your information, messages, and notifications displayed on your outer wrist may concern you in regards to privacy and constant distractions. Using the Barrel line, I am able to maintain the traditional watch I prefer that tells the time and compliments my clothing. The Barrel’s DUO band eliminates the struggle of choosing between fashion and technology. You get it all with any of the watches they offer. Original Grain launched their campaign on June 18th and will be life for an additional 35 days. 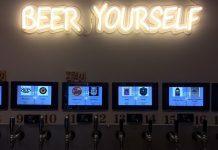 It will be run for 35 days and offers its Kickstarter backers certain perks to choose from, including Early Bird discounts. Each watch in this collection is available as a stand alone item, or with the Original Grain custom DUO connection clasp that can be added to any wood and steel designs offered. If you decide to pledge $129 or more, the first 500 backers will receive their choice of any watch in the collection. A pretty great deal if you ask me, since the full retail price will be $299 when the run ends.